Selling food in Nairobi's informal settlements can provide cheap meals and create vital livelihoods, especially for women, but these providers are usually ignored and remain invisible. For vendors in Nairobi's informal settlements, it is always a struggle to earn a livelihood and maintain food safety. Refrigeration is rare, and many water taps are contaminated or far away. Rubbish collection, drainage, and sanitation may be non-existent. Shared learning, training, and advocacy Grassroots-led research in Nairobi's informal settlements has highlighted the importance of food vendors and helped develop new ways to support them. Muungano and the Akiba Mashinani Trust (AMT), which offers financial and technical assistance to the federation, have previously analysed vending in three of Nairobi's informal settlements (also, see the 'Cooking up a storm: community-led mapping and advocacy with food vendors in Nairobi's informal settlements briefing paper). The partners have now explored vending in two other settlements of Korogocho and Viwandani, using surveys, maps and focus group discussions with food vendors. Korogocho is a large informal settlement located 12km from the city centre, while Viwandani is found in Nairobi's industrial area. Thanks to an upgrading project that recently improved Korogocho's roads, water, and other infrastructure, vendors rarely experience the floods, dust, fires, and other hazards that remain common in Viwandani. In response, the project has created a Food Vendors' Association (FVA) to develop supportive interventions and amplify traders' voices beyond their settlements. Additionally, FVA leaders are organising training for vendors in food handling and hygiene, supported by partners at IIED, the International Livestock Institute, and the African Population Health and Research Centre. Nancy Njoki, an FVA leader, said these initiatives have enhanced environmental awareness among vendors, who have also begun advocating for food markets in their settlements. The project "has helped us redefine advocacy approaches for upgrading sanitation and infrastructure in the informal settlements," she said. According to one Korogocho food seller, vendors can feed local families for a whole day for just a few shillings (GBP£1 is equivalent to 150 shillings): "For beans, we start selling at 10 shillings. If you have a family, and you have 50 shillings, you can buy rice and soup for 10 shillings [for five people]. And that can cover a day." Alongside these benefits, vendors face political, economic, and environmental challenges. 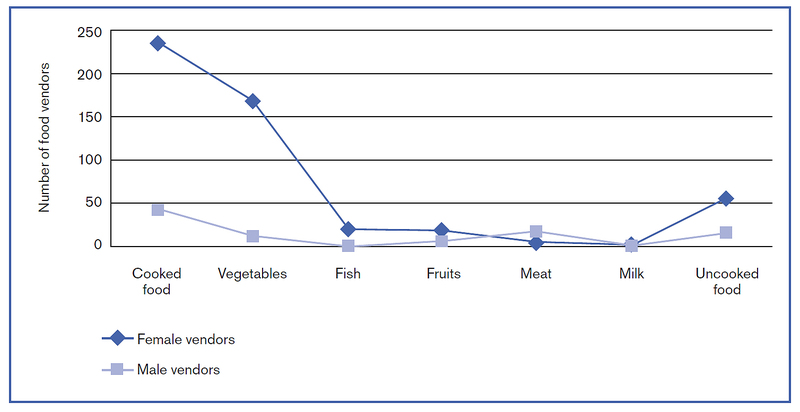 Food prices are rising sharply, but vendors cannot increase their selling prices (due to customers' low incomes). They also feel abandoned by Nairobi's government. Some vendors pay fees to the city council, but receive no services in return. During Nairobi's periodic cholera epidemics, local officials often scapegoat food vendors and close down their businesses. As a Viwandani vendor declared: "We feel like there is no government because there's nothing that we've seen done by the government." Vendors argued for improving food storage facilities, and they also require adequate water, sanitation, and rubbish collection to reduce floods or other hazards. Many vendors sell along footpaths or main roads, underscoring the need for upgraded roads to support livelihoods in informal settlements. Providing hygiene training to vendors, as the FVA has recently done, will also improve access to safe foods. Korogocho's vendors consistently identified youth unemployment and insecurity as their major challenges. But with improved livelihoods, they argued that young people would buy from vendors instead of stealing. By nourishing these workers' livelihoods, policymakers can finally recognise the pivotal role of street foods for the urban poor. With greater policy support and inclusive organisations like the FVA, vendors can lead the way towards healthy food and more equitable development in informal settlements. DOWNLOAD: Nourishing livelihoods: recognising and supporting food vendors in Nairobi’s informal settlements --> http://pubs.iied.org/10762IIED.html. Alice Sverdlik is a PhD student in city planning at the University of California, Berkeley, and a former research assistant at IIED. This blog was written with the support of the paper's co-authors, Grace Githiri, Regina Ngugi and Patrick Njoroge. We gratefully acknowledge FVA and Muungano wa Wanavijiji members, who have inspired and spearheaded this project.